A few years ago, the Texas Supreme Court severely altered personal injury litigation. In Haygood v. de Escabedo, the Texas Supreme Court changed the way juries hear evidence in personal injury cases by limiting the way Plaintiffs present medical costs. Part of damages in a personal injury case is reimbursement for medical bills already incurred. In some jurisdictions, Plaintiffs are allowed to recover their total medical bills (incurred as a result of the accident) as actually billed. Some jurisdictions allow Plaintiffs to present evidence of their total medical bills as actually billed, but then after the trial, the Judge reduces the amount that the jury awards for medical bills incurred to the amount that was actually paid. Finally, some jurisdictions only allow Plaintiffs to present evidence and recover their medical bills in the amount that was actually paid. The previous paragraph can be better explained by an example. In some personal injury cases, a Plaintiff’s medical bills are paid by a third party source, i.e. Medicare, Medicaid or a personal health insurance policy. Let’s pretend that a Plaintiff incurs $100,000 in medical bills as a result of an accident. Let’s also pretend that this particular Plaintiff has personal health insurance. As you may know or have experienced, most health insurance companies have a reduced rate that they pay on hospital medical bills, as does Medicare and Medicaid. Let’s further pretend that the Plaintiff’s health insurance carrier ends up only paying $25,000 on the billed amount of $100,000. In some jurisdictions, the Court allows the Plaintiff to present to the jury the billed amount of $100,000 in incurred medical bills. Further, if the jury awards the full $100,000, then the Plaintiff recovers the entire $100,000. In some jurisdictions, the Court allows the Plaintiff to present to the jury the $100,000 in medical bills incurred, but after the trial ends, the Judge reduces the $100,000 to $25,000 (assuming that the jury awards 100% of the medical bills as damages). Finally, some jurisdictions only allow the Plaintiff to present the jury with evidence of the actual medical bills paid, in this case, $25,000. You may be asking yourself, what is the practical difference between scenario 2 and 3 above? They both result in a $25,000 award to the Plaintiff for medical bill reimbursements. However, there is a difference. Jurors may perceive an injury that has incurred $100,000 in medical bills more serious than an injury that results in $25,000 in medical bills. This perception may alter the amount that the jury awards for pain and suffering damages (a more serious injury is assumed to have more pain and suffering). Generally, it is expected that scenario 2 will result in a higher award for pain and suffering damages than scenario 3. This decision is flawed for two main reasons. It penalizes individuals who have health insurance. Plaintiffs that have no third party available to pay their medical bills are allowed to recover their full billed amount on their medical bills while Plaintiffs that have health insurance are only allowed to recover the amount actually paid. Further, part of personal injury damages is recovery for future medical bills. 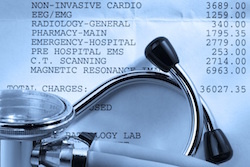 Future medical bills are naturally based on what the past medical bills have been. There is no guarantee that a Plaintiff will continue to have health insurance in the future and will have access to a reduced insurance rate for medical bills. If a jury awards future medical bills based on the insurance rate for past medical bills and then the Plaintiff loses his/her health insurance, then the future medical award will be inadequate. Prior to Haygood v. de Escabedo, Texas operated under scenario 2, where the Plaintiff was allowed to present his/her entire medical bills as billed and that amount was reduced post-trial to the amount actual paid. After Haygood v. de Escabedo, Texas now operates under scenario 3, where the jury is only allowed to hear evidence of the actual medical bills paid amount. It is important that a Plaintiff understands this change in law and presents his/her case in a way that maximizes recovery under the new law.